← 2012 SCS Nationals! Whoohoo! Hiya! Today is Tuesday Training! Before I move on to today’s subject, I want to tell you why I post on what I do on Tuesdays and Wednesdays in particular. 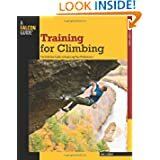 I learned that climbing is made up of three different but equal categories while reading the book Training for Climbing by Eric J. Horst. Horst says,”Rock climbing is unique among sports, however, in that it requires a near-equal balance of mental, technical, and physical prowess.” In other words, climbing is 1/3 mental, physical, and technical. That is why I will focus on each of these categories in my posts. So, on to today’s post. . .
Visualization is an invaluable skill for climbers. In its simplest form, visualization is sequencing a route and then vividly imagining yourself climbing it and feeling the unique thrill of a send, all before leaving the ground. I will fall back on my handy-dandy Training for Climbing book once more today. Eric Horst explains that there are two types of visualization, disassociated and associated visualization. He says that disassociated visualization is imagining yourself climbing a route through another person’s eyes. He says, “Reserve this perspective for reviewing negative events from the past… Gather the information you need to improve your performance next time, then engage in associated visualization to preprogram the corrections into a successful future event.” Horst says that associated visualization is vividly seeing a climb through your own eyes, like you are actually doing it. “Associated visualization provides a ‘through-your-own-eyes’ perspective and thus triggers small neurological reactions as if you were doing the climb, as well as the feel and emotion of the movie you are playing,” Horst explains. “This makes associated visualization ideal for preprogramming some future ascent… repeated playing of a highly deatailed, positive mental movie helps trick the subconscous mind into thinking you’ve done the climb before. Just make sure you are using the associated, not disassociated, perspective when visualizing some future event.” Visualization is something cool to try and will hopefully improve your climbing, too! Also see this article about visualization at another favorite site of mine: “The Power of Visualization” (rock-climbing-for-life.com). Today’s challenge is… (drum roll please)… use associated and disassociated visualization on the rocks or at your home gym, and use the drop knee technique on three different climbs! Please write your name in the comments to tell me you completed the challenge! Let me know how the visualization experiment went as well!